Located in a deep gorge to the west of Chola Mountain, Dege (སྡེ་དགེ།) is one of Tibet’s most revered and remote places. It’s found in the far northwestern Sichuan Provence very close to the boarder of Xizang Provence (modern “Tibet”). Dege (aka Derge) is home to the most important printing press in all of Tibet, the Barkhang (Parkhang) Scripture Printing House. Dege is a full day’s bus ride from the nearest town, Ganze. Basically, you need to drive all the way around the formidable Chola Mountain and sometimes you’ll think the bus is driving straight over it. A perilous dirt road winds up and over Tro La (Chola) Pass at nearly 6000m (19,6850ft) – a lot higher than Mt Everest Base Camp! 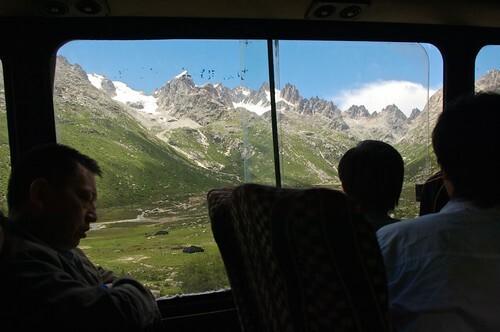 The views from the bus will leave you breathless in more ways than one. 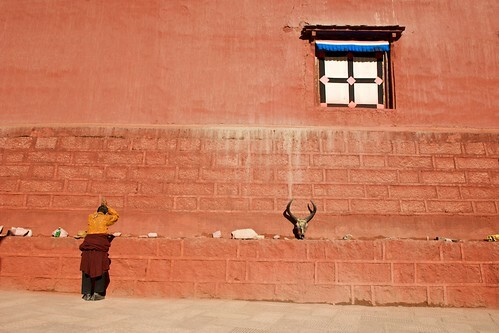 A man prays in front of the famous Barkhang (Parkhang) Scripture Printing Press in Dege, China (Tibet). 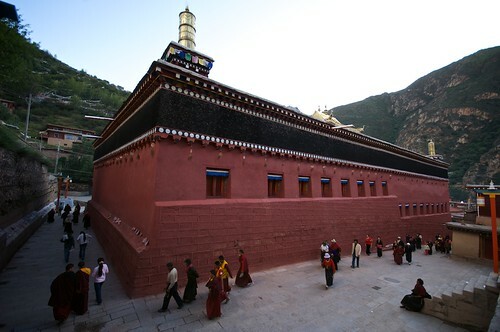 Founded in 1729, the Barkhang (Parkhang) Scripture Printing House is the main attraction of Dege. The press is one of the three most holy places in Tibetan Buddhism (along with the Potala Palace and Sakya Monastery) and people will travel here from all over Tibet to walk holy koras (circular holy walks) around it. The holy Barkhang (Parkhang) Printing Press in Dege (Derge), Tibet (China). 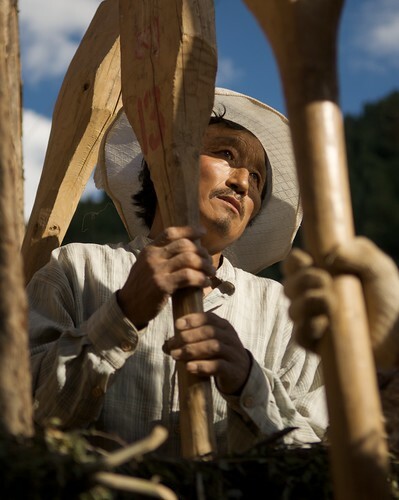 A Tibetan man walks a kora around the Barkhang (Parkhang) Printing Press in Dege, Tibet. 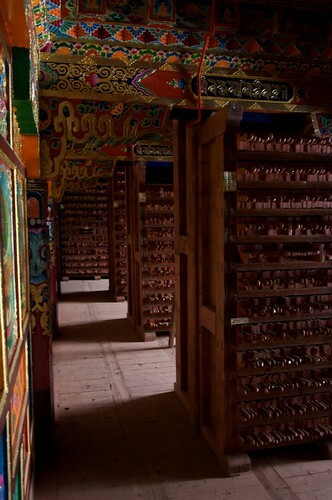 The interior of the Barkhang (Parkhang) Printing Press in Dege, Tibet. The town is quaint, with a mixture of traditional houses and new Chinese style concrete buildings. I found the locals to be very friendly and welcoming, and a little curious to travelers who are walking around independently. It’s seems that most of the tourists here are the Chinese package tour style, or foreigners in 4x4s headed to deeper Tibet. If you’re traveling by bus, Dege is at the end of a long spur of a road. While it continues into Tibet, foreigners are not allowed to go this route without a tour guide. I assume that most independent travelers don’t want to spend a hard day on the public bus getting there, just to turn around and go back the way they came. 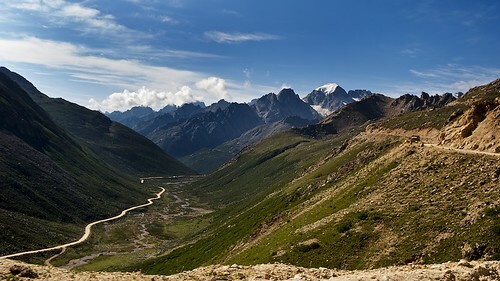 The Northern Sichuan-Tibet Highway, just at the Tro La (Chola) Pass at nearly 6000m (19,6850ft). 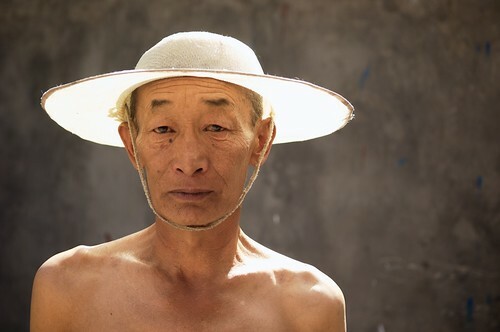 A portrait of a shirtless Tibetan man with a straw hat in Dege, China. 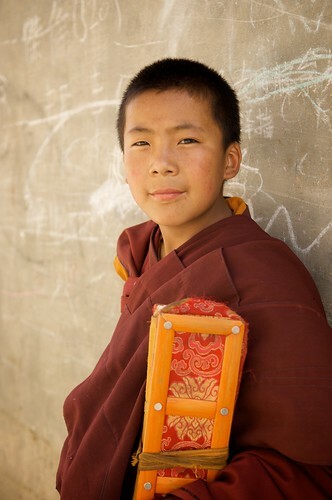 A novice Tibetan monk holding holy scriptures from the famous Barkhang (Parkhang) printing press in Dege, China (Tibet). 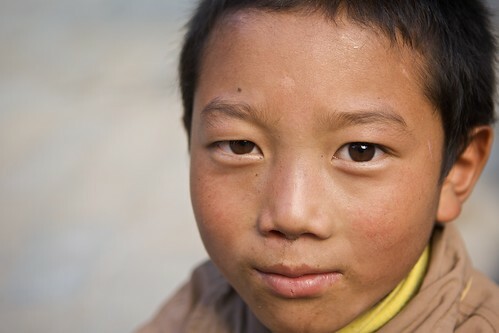 This boy and his friend were my shadows the whole time I was in Dege, Tibet. They managed to find me every morning and follow me for most of the day. Two Tibetan women sit outside their home in Dege, Tibet. 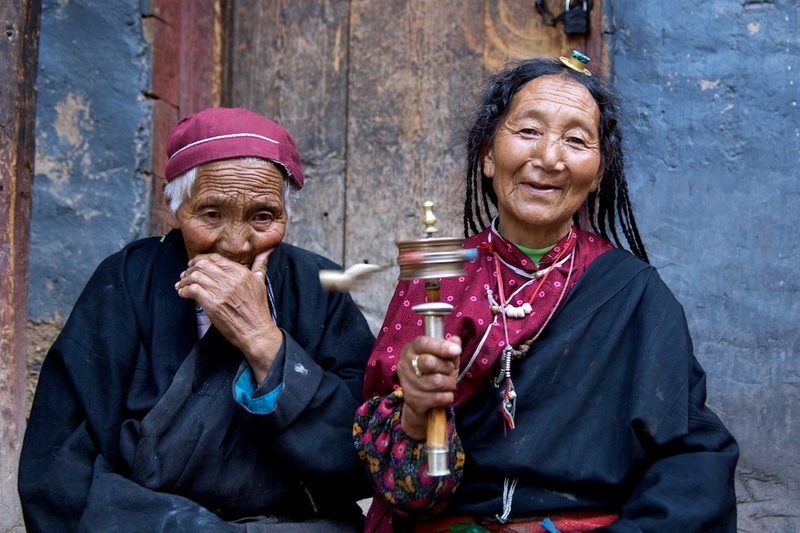 The woman on the right is spinning a prayer wheel that brings good karma with every spin. The woman on the left isn’t coughing, she wanted her picture taken but she didn’t want to show her teeth. As I wandered the streets, I came upon a group of people building a traditional house. They were singing and laughing and just having a good time so I hung around and showed my interest in what they were doing. As usual, they were as curious about me as I was of them and they invited me to hang out with them. Showing them the pictures on the back of my digital camera had the usual results and they posed (or hid) from the camera with great excitement. 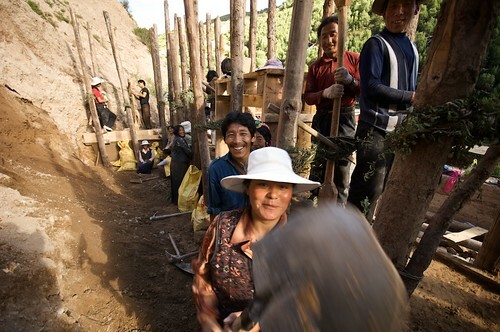 These workers were singing as they built a traditional mud house in Dege, China (Tibet). 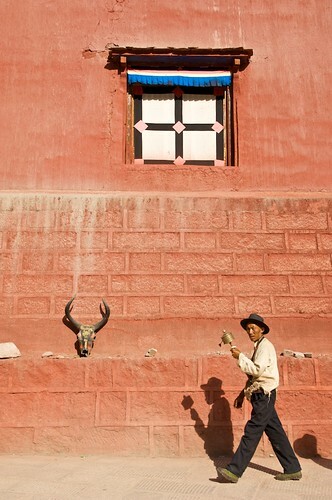 A man takes a break from building a traditional Tibetan house to force his friend to take a picture in Dege, Tibet. A Tibetan woman jokingly reacts to having her picture taken in Dege, Tibet. After leaving Dege, I found out that it’s one of the best places in all of China to do some hiking. There are both day trails and trails that cut back to Manigango and have convenient guest houses at the end of each of the 3-4 day hike. Cheers, the next stop is Yushu, in QingHai Provence. This is the fifth article on my travels to Tibet. The next will be about Yushu, in QingHai Provence. The last was about Ganze. The rest of the articles can be found here. great photos, looks an awesome place! Thank you. 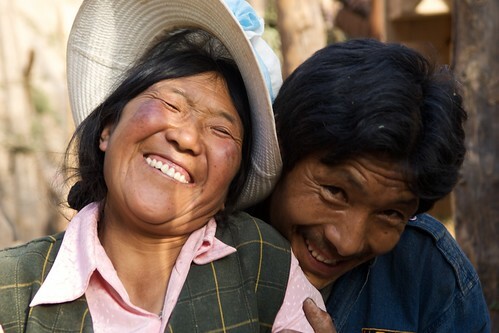 In general, Tibetans are very friendly and welcoming even when taking their pictures. However, they can also be quite fierce, so you have to know when enough is enough. Great photos! 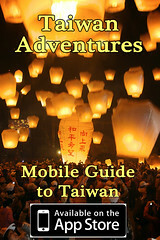 I lived in China for three years, starting in 2001, and was able to travel quite a bit. It is an incredible country. I also remember that most people were very open to having their photos taken — while other not so much. But usually it was me being asked to have my photo taken, just because I’m tall (I’m not even that tall)… Have a great rest of your trip. All photos are good, but the portraits are amazing. Thanks for sharing. Great photos, however it disturbs me when you say Tibet brackets China. Thank you Dave. You bring up a very good point. The reason I’ve been putting “China” in parentheses in the titles of the posts probably isn’t why you think. Many people know a little about the Tibetans’ plight. And I know that there are many, many people in the West who want Tibet’s freedom. But what a lot of people don’t realize is that what you see to be Tibet on a modern day map of China is actually only about 1/3 of what was Tibet before the Chinese invasion. What most people now refer to as “Tibet” is actually the Tibet Autonomous Region or “Xijang.” The Kingdom of Tibet was actually almost three times the size of Xijang. The Chinese divided Tibet into pieces and what was originally Tibet can now be found in the Chinese provinces of Yunnan, Sichuan, Qinhai, and Gansu. The funny thing is, that the Tibetans in these areas are often more free to to express their culture and religion than those found in Xijang, making these great areas to visit. So yes, I always grit my teeth a little when I put “China” in parentheses after the name Tibet. But I feel it’s warranted due to the confusion that might arise if I just call these regions “Tibet” and people can’t find them on a map. Hopefully as people look into traveling to these areas, they will learn more about the current (and past) issues that face Tibetans, just like I did. Luminous and enlightening post and photos. Now I am craving Tibetan Butter Tea. Happy sigh. Thanks for letting us travel with you. Really nice images – the worker portrait and the close up of the kid especially – can see something special about them. Currently I’m running a fund raiser for Compassion Bloggers. For every photo posted under Compassion Bloggers on my site that gives the photographers view of poverty, I will donate 1cent toward Compassion Bloggers. I know it doesn’t seem like a lot but this is my first blog and Im hoping for it to grow and my contributions. Thank You and your work is amazing. Tibet is a great fantastic place. Your picutres are stunning! Me and Jenny loved it there. It’s a whole new world, full of vibrent colour and tradtion. All though which you have captured wonderfuly. Sorry for English, my natural tounge is Japanese adn ym English suffers when I am sleepy! Love the pictures! Thanks a lot for sharing them! Thank you for sharing these pics. I have always had an acute interest in Tibet. Enlightening comment about the wider Tibet and the images speak for themselves. Beautiful pictures. Especially the interior of the printing press. I would love to travel to Tibet or Nepal one day. Your photos inspire me–thank you for sharing them! Nice pictures. Just looking at them soothes your nerves and takes you away from the hustle and bustle of modern life. Wow! Your photos are fantastic! Geat job. wow, you have some pretty amazing photos. looks like quite a unique experience! Excellent post, beautiful pictures…definitely a place I would like to visit! I really appreciate all the nice comments! Wonderful project. I am wondering if it is possible to photograph and visit the area where the printing is being done? If one is respectful, were there any restrictions to photographing inside the printing press building? Thanks Jeffrey. There are signs when you enter the printing press that say “No Photographs.” That said, it doesn’t hurt to ask in a respectful way. One thing I remember about the site was Chinese tourists ripping up to the building in their 4x4s, rudely taking pictures (if you know what I mean), then jumping back in their trucks and leaving. Maybe the signs are meant for them. hey, i think the pass is 49xx,m high and not almost 6000 right ;)?